There’s a lot to be said about being outdoors in our part of the world. Marianne and I live here year round and we find that a breeze and shade are about all the air conditioning we ever need. The flowers are blooming, the birds singing and the hummingbirds constantly flit through the coleus flowers we have on the patio. It is also the best way to enjoy the natural symphony that the monsoon brings this time of year. 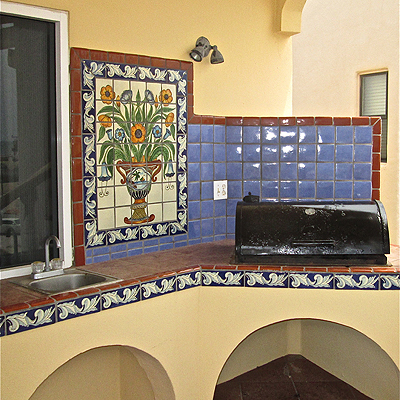 Essential to this lifestyle is to have an outdoor kitchen. A built in BBQ, a good sized cement, ceramic or stone sink and plenty of prep counter. Perhaps even an eating bar. Room under counter for a small refer or ice chest, and the party can stay outside indefinitely. The ideal finish for this space is ceramic tile. Not only can it be a unique and beautiful design, but good ceramic is forever. Our outdoor kitchen is 13 years old. I keep a short hose, nozzle and counter scrub brush under the sink. Cleanup is just that simple. It looks as good as it did when we first installed it. 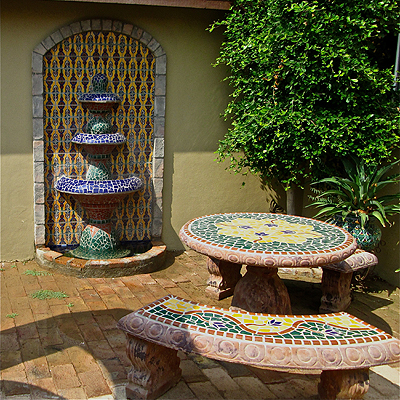 Another aspect to outdoor living is water features. Even a small fountain can be very relaxing during the dry season, or when we’re waiting for the rains to come. Our home is close enough to the beach that we get by with the sound of the waves, but we wouldn’t be without an outdoor shower to rinse off the sand and salt before going inside. All of this tucked into ever changing flowers and plants along with the birds they attract. A functional and beautiful tile design in a beautiful setting, convenience and comfort…it’s a great way to enhance the enjoyment of your home in paradise.